One of them is his ex-business partner, two others are law enforcers. 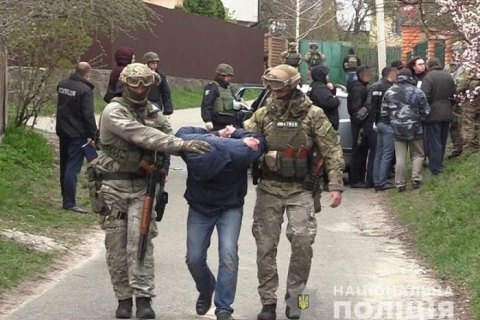 Police have detained three suspected murderers of jewellery business owner Serhiy Kyselyov in Kyiv, the head of the main department of the National Police in Kyiv, Andriy Kryshchenko, has said at a briefing, according to Ukrainian News. In his words, the criminals wanted to abduct the jeweller and extort a ransom for his release. "We have managed to identify this crime group of three people," he said. The suspects are Ukrainian nationals. They were detained on 13 April. One of them had a previous conviction. One is a former business partner of Kyselyov. Kryshchenko said that police had confiscated six grenades, two Makarov pistols and TNT. One grenade was seized in the course of the detention. According to the Interior Ministry, one of the suspects was found to possess a painting by Paul Signac worth 1.5m dollars which was stolen in France. "Several paintings were found among the things confiscated from one of the suspects. One of them looks like a painting stolen from the Museum of Fine Arts in Nancy, France last year. It is the 1915 painting "Port of La Rochelle" by Paul Signac. It is worth 1.5m dollars. It is unclear yet whether it is the original copy. An art examination will be assigned," Interior Minister Arsen Avakov said. In March, an unidentified man in fatigues similar to those worn by police shot dead jewelry factory owner Serhiy Kyselyov in Kyiv.